090910-1: 3-colourings, Reidemeister's theorem, invariance, the Kauffman bracket. 090910-2: R23 invariance of the bracket, R1, the writhe, the Jones polynomial, programming the Jones polynomial. 2 Sep 14 090915: More on Jones, some pathologies and more on Reidemeister, our overall agenda. 090917-1: The definition of finite type, weight systems, Jones is a finite type series. 090917-2: The skein relation for Jones; HOMFLY-PT and Conway; the weight system of Jones. 3 Sep 21 090922: FI, 4T, HOMFLY and FI and 4T, statement of the Fundamental Theorem, framed knots. 090924-1: Some dimensions of , is a commutative algebra, . 090924-2: is a co-commutative algebra, the relation with products of invariants, is a bi-algebra. 090929: The Milnor-Moore theorem, primitives, the map . 091001-1: Jacobi diagrams, AS, IHX, STU, and the equivalence of all that with 4T. 091001-2: The very basics on Lie algebras. 5 Oct 5 091006: Lie algebraic weight systems, . 091008-1: More on , Lie algebras and the four colour theorem. 091008-2: The "abstract tenssor" approach to weight systems, and PBW, the map . 6 Oct 12 091013: Algebraic properties of vs. algebraic properties of . 7 Oct 19 091020: Universal finite type invariants, filtered and graded spaces, expansions. 091022-1: The Stonehenge Story to IHX and STU. 091022-2: The Stonhenge Story: anomalies, framings, relation with physics. 8 Oct 26 091027: Knotted trivalent graphs and their chord diagrams. 091029-1: Zsuzsi Dancso on the Kontsevich Integral (1). 091029-2: Zsuzsi Dancso on the Kontsevich Integral (2). 9 Nov 2 091103: The details of . 091105-1: Three basic problems: genus, unknotting numbers, ribbon knots. 091105-2: The three basic problems and algebraic knot theory. 10 Nov 9 091110: Tangles and planar algebras, shielding and the generators of KTG. 091119-1: Local Khovanov homology, I. 091119-2: Local Khovanov homology, II. 12 Nov 23 091124: Emulation of one structure inside another, deriving the pentagon. 091126-1: Peter Lee on braided monoidal categories, I. 091126-2: Peter Lee on braided monoidal categories, II. 13 Nov 30 091201: The relations in KTG. 091203-1: The Existence of the Exponential Function. 091203-2: The Final Exam, Dror's failures. F Dec 7 The Final Exam on Thu Dec 10, 9-11, Bahen 6183. 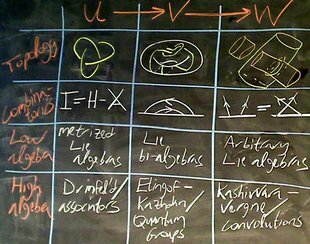 Agenda: Understand "(u, v, and w knots) x (topology, combinatorics, low algebra, and high algebra)". Understand the promise and the difficulty of the not-yet-existant "Algebraic Knot Theory". Classes: Tuesdays 10-11 in 215 Huron room 1018 and Thursdays 9-11 in Bahen 6183. Math 1352S - Knot Theory in Spring 2007. Math 1350F - Knot Theory in Fall 2006. This page was last modified on 7 September 2009, at 19:15.